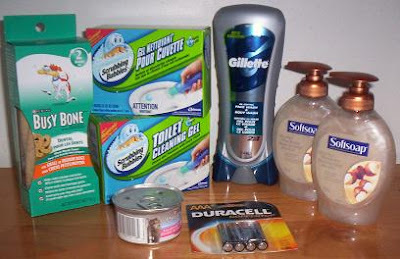 We went out expecting to spend a few coupons, and ended up with a bunch more freebies! First we dropped my son Josh off at work at the SuperStore®, and after grocery shopping where we picked up the Busy Bone® for $0.49, we went to the Walmart® next door. Out front was a Scrubbing Bubbles® trailer display, so we thought we would go in and check it out. The guy demonstrated their new products, their new toilet bowl cleaner, two types of shower cleaners and a sink cleaner. They gave us a handful of free coupons for their toilet bowl cleaner! I ended up with 8 free Scrubbing Bubbles® coupons, but we only picked up two boxes - which is a good thing as I personally find the scent too strong. After Walmart®, we stopped into Petsmart® to cash in our free cat food coupon. Rob and Josh laughed at me, since we didn't even have a cat at that time, but when I went thru the cash, a coupon for $5.00 came up on the receipt to do a call-in survey, so now we have $5.00 more dollars to buy dog food for free!